Britain's pop group The Beatles pose in a carriage window of train before they left Paddington Station, London, March 2, 1964, to start filming their first feature film. Top left is John Lennon, with George Harrison next to him, and Ringo Starr, bottom left, with Paul McCartney next to him. 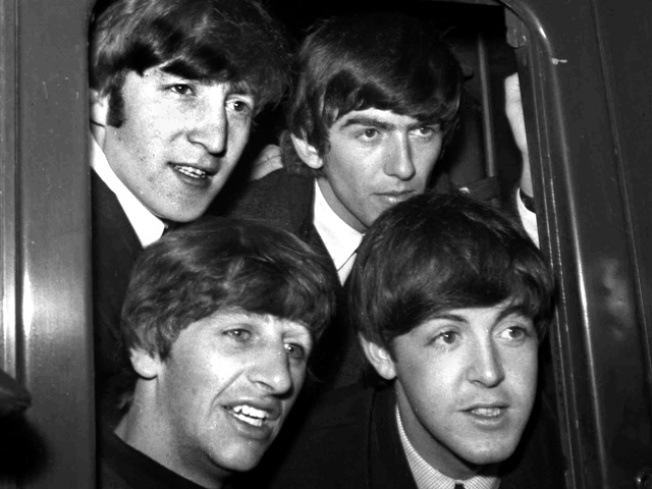 The Fab Four’s invasion 2.0 didn’t induce Beatlemania, but wasn't too shabby either. In the first week since the Beatles’ catalogue was released here, there and everywhere on iTunes, the group sold more than two million singles and 450,000 albums, Reuters reported. “Abbey Road” was the group’s bestseller in the U.S. and landed at No. 6 on the charts for Apple’s digital music store, the company said on Tuesday. “The Beatles Box Set,” a $149 compilation that includes all 13 of the band’s original albums, came in at No. 10 on the charts for the week. "Here Comes the Sun" was the top-seller stateside, but did not crack the iTunes charts, Reuters also reported. Over the pond, just one song, “Hey Jude,” landed on the U.K. Top 40 charts, the Guardian reported. Two Beatles greatest hits compilations, “Blue” and “Red,” were the only albums to make a splash on the charts for the week, according to the paper.